A good drawing board is the foundation of practicing art. If you’re a beginner then you’ll need a quality board to last a while as you plow through exercises. 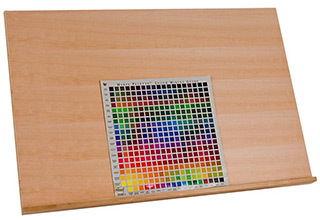 The best overall drawing board is the Art Advantage Board measuring about 23″ by 26″. It’s super thin so you can lean it up against a desk while drawing, or tuck it under your bed when you’re done. Plus it comes with clip holders to keep your paper in place. But this is only my recommendation as a generalist’s board. There are so many more options to choose from with a good deal of garbage to wade through. 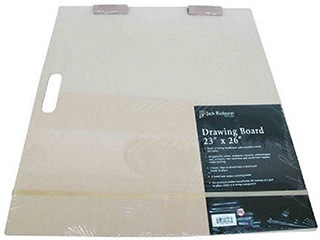 Some cheaper drawing boards have rough coarse surfaces that you need to either sand or cover with paper. Others are too small or feel too flimsy for drawing. In this guide I’ll share the absolute best drawing boards for the money. I’ll cover a wide swath of varieties, wood styles, and sizes explaining the pros & cons of each. If you’re looking for a drawing board then this post will answer all of your questions. First and foremost you need to know why you’re getting a drawing board. Obviously it’s for drawing, but for what type of drawing? Are you a complete beginner working in graphite? 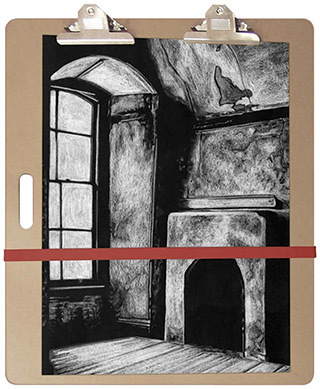 Or will you bring finished charcoal studies to completion with this board? Also do you need a lightweight board for travel or drawing outside? Or would you prefer a heavier board that can mount on an easel? Start by deciding what you need first. Estimate your goals and consider what type of drawing work you’ll be doing. Also consider how much money you want to spend—most boards are cheap but some can get up there. And be sure to measure how much space you have. This matters when you’re trying to find a spot to leave your board after drawing sessions. Measure your closet, beside your desk, under your bed, or anywhere else that might work as a storage space. Remember that it’s common to have more than one drawing board. They come in all different shapes & sizes so don’t think one board has to be your only option. There’s a lot to choose with many different benefits to each. 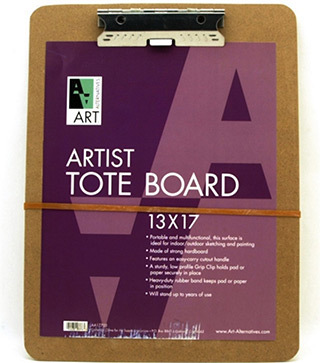 Art Advantage makes great quality materials and their 23×26 Artist Sketch Board is a great buy. This is one of the best choices for a complete beginner who wants to dive in and start drawing fast. The surface is incredibly smooth and you can rotate it around as needed. The clips are not removable but they really don’t get in the way. If you’re drawing on printer paper there should be plenty of empty space left. And you can orient the board so the clips lie to the other side of your drawing hand so your elbow never bumps into them. This board is light only weighing 3.5 lbs. Even if you clip an entire sketchpad onto the board it’s still pretty light. Newer artists want the freedom to try stuff and just draw. This Art Advantage sketchboard grants you that freedom. Not to mention it’s light enough to bring anywhere. Whether you’re sketching on your bed, in the backyard, or even in a figure class, this board should suffice for all occasions. Bottom Line: Incredible drawing board for beginners and for lightweight travel. Large enough for sketch pads and strong clips to hold pads in place. For larger easels I find it’s best to go with a thicker drawing board. The Alvin DB114 Art Board is very sturdy with a crisp wood veneer finish. It measures 18″ x 24″ which is a great size for finished pieces. Whether you’re drawing a still life or doing a self portrait, this board can hold it all. Surprisingly it’s about 6 lbs which isn’t much heavier than smaller boards. It comes with a metal edge on the side and it’s about 1 inch thick. This thick edge works well for architects or engineers who frequently use T-squares and related measuring tools. But this board is not without it’s flaws. The surface isn’t fully finished in many places so you’d do best clipping a pad underneath. Or if you buy a large pad of thick paper you can tear off a piece and keep that underneath your drawing area. Folks who are DIY-oriented might even sand down the surface to make it thinner. I can’t say this board is terrible for the price, but it certainly doesn’t offer the smoothest surface. 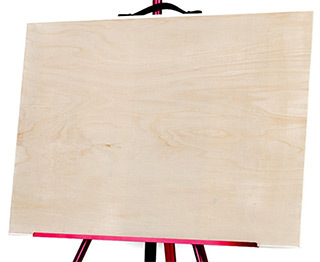 Bottom Line: Get this board for an easel or for drawing on a sketchpad. It’s sturdy and thicker than most but does not have a perfectly smooth surface. Adjustable drawing boards are the coolest things since sliced bread. And the SoHo Urban Artist Board is one of the best adjustable boards you can get. It has a strange size measuring a total of 20″ tall x 30″ wide. But this size offers plenty of room for any piece of paper or sketch pad you might bring along. As a simple board it can lay flat or be leaned up against a desk. It may also fit into an easel depending on how much space is available on the easel’s holder blocks. But the real beauty of the SoHo board is the adjustable back which can be positioned into one of five different slots. The board can lie flat or be tilted up almost completely straight. I’d guess maybe 75° at the highest setting. It’s all designed with beech wood and treated to a clean finish. The drawing surface is incredibly smooth so you won’t have any issues with nicks or holes in your artwork. If you’re someone who likes to draw outside or on the go then this board is perfect. It is a touch on the heavier side weighing about 10 lbs. Not fun to lug around but definitely do-able. Note at the bottom of the board there is a small lip extruding about 1 inch outwards. This is here to keep your paper in place while drawing at the higher positions. But when drawing flat this lip can get in the way. To get around this simply rotate your board the other direction. It may get annoying constantly rotating the board around but it’s a small price to pay for a fully adjustable board that doesn’t require clips. 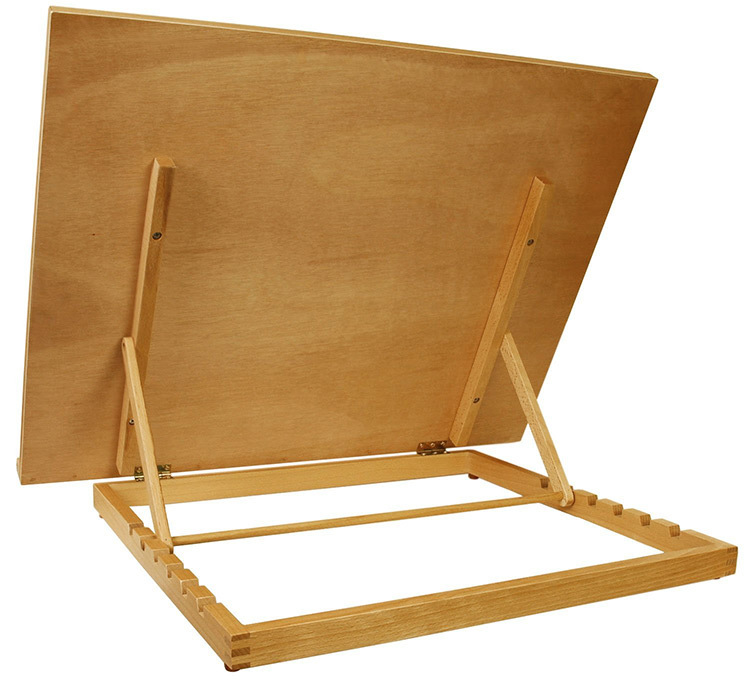 Bottom Line: Nice adjustable drawing board for any age or skill level. It’s affordable, made of quality wood, and offers five different positions along with a completely flat position. Another great option for the adjustable board route is US Art Supply’s XL Adjustable Sketch Board. The finish on this board is glorious and it really shines in the light. It measures 26″ wide(almost 2 feet) and just under 21″ tall. There’s no denying this is a big board. And to me that’s awesome because it offers value for many different artists who work on different types of paper(and different sizes of sketch pads). With this board you’ll get seven different positions ranging from completely flat to upright at an 80° angle. And when you’re drawing on this board it’ll feel like a finely crafted wooden desk. It’s lightweight and surprisingly thin for such a large board. When lying flat this board only measures 3 inches tall. It can fit pretty much anywhere in your closet, under the bed, against your wall… wherever! It’s a convenient art board for the size and the construction is tops. This board is a bit lighter than the SoHo which makes it ideal for travel. Not to mention you get more adjustable positions and the same pencil lip ledge to keep your paper & pencil in place while drawing. Bottom Line: Amazing adjustable board for beginners and experts alike. It’s huge and can hold almost any sized sketch pad. It comes with a sturdy foundation and could even be great for kids just getting into art. The Martin Portable Sketch Board is designed for portability first. It weighs 6lbs with a handle on one side for an easy grip. This model comes in two sizes: small and large. But the small size should be big enough measuring 24″ wide(2 feet) x 19″ tall. The larger board is only about 6 inches bigger in both directions. But it can make a difference if you like to work big. You can even clip your board to the top with a built-in pinch clip. The surface is very smooth although I’m not sure what the material is. And looking towards the back edge you’ll find two drop-down legs to prop up the board at an angle. It’s a huge benefit for artists who want to draw from an angle sometimes, while other times keeping the board flat. My big issue is that it’s a thick board measuring over 3″ on the side. This isn’t inherently bad, and sometimes a thicker board is good(especially while traveling). But if you just want a simple drawing board for home use I do think the Art Advantage Board is a better pick. Bottom Line: The Martin portable board is solid, easy to carry, and comes with foldable legs for a minor 30° incline. Great for drawing or painting on the go but may not be worth the price for most people. Now here’s an artboard that you can take to school, keep at home, bring to figure class, or even all three. LOHOME’s drawing board is made of solid maple wood and very durable. It’s surprisingly thin measuring only 1 inch on the sides. The total dimensions measure 24″ wide(2 feet) by 18″ tall(1.5 feet). Plenty of room for your average sketch pad. And weighing only 2 pounds this board is light. It’s one of the few drawing boards that actually feels light while still being pretty thick on the edges. On the top you’ll find a nifty to-go carry handle perfect for moving this around anywhere. You can even keep your drawing/painting clipped to the board as you go and carrying by the handle won’t damage anything. Few artists know about the LOHOME brand but they make nice stuff. This portable drawing board is a fine example of great quality and definitely worth checking out if you want a thick yet light board for any situation. Bottom Line: This board’s design sells itself as a thick yet light drawing board with a clean surface. Great for home practice and figure classes or for drawing outdoors. Drawing is not the only thing you can do on a board. Artists also do watercolors on drawing boards if the paper is thick enough. And the Springer Atlas SN2 is perfect for watercolors, acrylics, and of course drawing with any medium. The board is made of masonite so it’s pretty thin and light(weighs 3.3 lbs). It measures a standard 18″ x 24″ which is perfect for drawing pads or even smaller paper like A4 copy paper. This board can work on any easel because it is thin. I’m talkin’ ¼ of an inch thin. While drawing it may actually feel too thin if you apply hard pressure. But the hardboard masonite is sturdy enough that it won’t just break under pressure. However because it’s so thin you need to support the back if you do any wet mediums like watercolors. Yes they can work well, but they can also leak through and stain the board. If you don’t care about colors getting into the masonite then no problem. But generally the surface feels better with some padding. I just don’t love the surface because it has a very minor tooth that feels too rough. Not super noticeable, but enough that I’d prefer to draw on top of a sheet or two of thick paper. Bottom Line: Very thin board, great for any light medium and perfect for travel. Also a nice board for watercolor painting. But the surface has a light tooth so if you don’t like that you’ll need to lay down some background paper. If you want a super cheap and super thin board then look into the Jack Richeson Sketch Clipboard. It comes with a carrying punchout hole so you can wrap your hand around and carry on the go. This measures about 23″ tall x 26″ wide and includes a heavy duty rubber band to keep your paper still while drawing. It does come with fixed clips that don’t work like ordinary chip clips. They have latches that you need to undo by pushing down & out. Very strange clips and they can be frustrating if you’re not used to them. I had these same clips on my first drawing board and basically ignored them. I would use my own chip clip because I was so frustrated. If you do get this and have trouble with the clips just look up tutorials on YouTube. Overall the surface is clean and it’s a flat board worth using if you like the larger size. Bottom Line: Light travel board with a handle and built-in clips. The clips are not intuitive so they can be frustrating. But the price is good and so is the drawing surface. It does not get much cheaper than the generic Alvin masonite boards. However cheap does not always equal bad. These boards are very sturdy and they really do work well for simple drawings. I wouldn’t want to use one of these on an easel, but it’s not a bad idea! This model measures 17″ tall x 22″ wide so it’s a little under 2 feet wide. You can find very similar masonite boards from Alvin in different sizes using the same designs(clean surface with single carrying hole). You’ll get a free portfolio carrying back with any of these drawing boards. They’re all pretty light, usually under 1-2 pounds and very thin. None are thicker than an inch which makes them great for leaning against a table, yet not as great fixed in an easel. If you hate those clips attached to other boards then you can pick up one of these Alvin Masonite boards on the cheap, totally clip-free. Bottom Line: Very affordable board made with masonite in a variety of different sizes. Comes with a free carrying bag and doesn’t have any fixed clips so it’s one of the lightest boards you can buy. 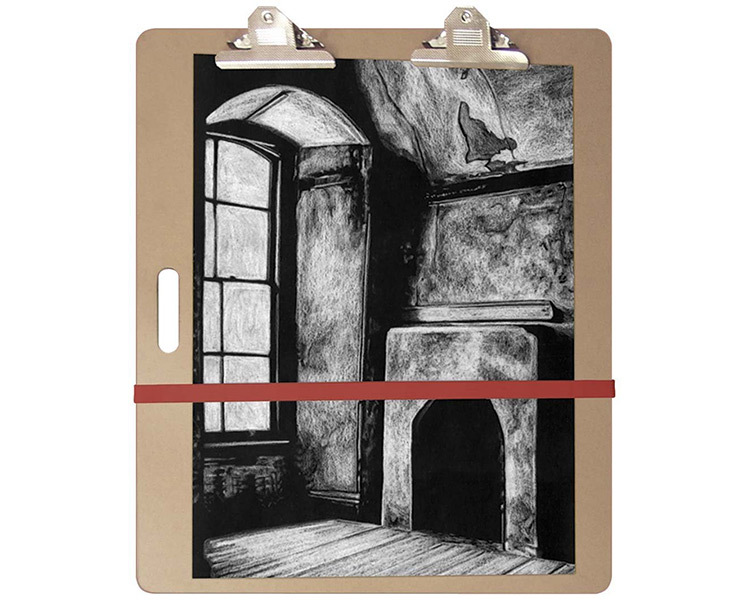 The Artist Tote Sketchboard is designed for artists on the go who want something real small. And I mean super small, basically the smallest you can get and still fit a decent sized piece of paper. In portrait orientation this board measures 13″ wide x 17″ tall. It’s the most portable option you can find if you’re OK to work on printer paper or A3 paper. It does come with a clip fastener at the top so you can keep your paper stationary while drawing. It’s probably the easiest to hold up while working so it’s great for drawing from life. You can take this to the coffee shop, out to school, into a field or anywhere that has great scenery. On the negative side it is a bit pricey considering what you’re getting. If you’re OK to forego the built-in clip you might wanna save some money and pick up a masonite board. However this is much sturdier than most of those thinner boards and it’s smaller to boot. Bottom Line: Excellent small board for kids or adults. Holds paper tight and feels light in your hands. But it’s only useful if you’re OK drawing on smaller paper like A3/A4 sizes. Almost every board can be deemed portable to some extent. But truly portable boards are designed to hold papers in place and offer a means of transportation. 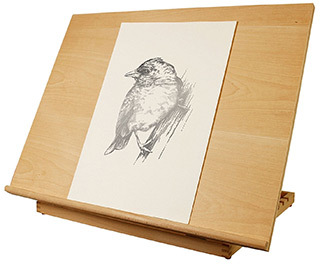 The best portable drawing board to fit this description is the Martin Portable Sketch Board. It has a built-in carry handle right at the top of the board. You can clip your paper to the side or to the top and never bump your hand against them while carrying. This board is designed thick with about 3 inches on all edges. But the drawing surface is flat and reasonably sized at 24″ wide x 19″ tall. On the back you’ll find two rubber pads with two extendable legs that you can pull down to get a slight angle. It certainly won’t be anything great, but drawing at a 30° incline can be better than a 0° incline. I’ve yet to find another portable drawing board with all these features that also has two different sizes(small or large) to choose from. Great sketch board for the money and a nice pick for on-the-go artists drawing life outside the home. There aren’t many “bad” adjustable drawing boards out there. Some just offer more features than others and they all come in different sizes. But the absolute best adjustable drawing board is the US Art Supply XL Adjustable Sketch Board. It measures a total of 26″ wide by 21″ tall. If this is too small you could shop around for larger ones. The reason I recommend this board is because it comes with everything. The wood is beautifully finished and the drawing surface is perfectly flat. It feels incredible to draw on this board and the quality craftsmanship is apparent from the get-go. It also comes with a lip for holding your pencils and keeping your paper flat. This is crucial since it also has seven different positions starting with completely flat parallel to the table, then moving up in degrees to a final tilt of about 80° upright. The XL adjustable board is made for sketching but could even work for painting too. I haven’t tried watercolors on it but if you lay down some paper it should be fine. Everyone from draftsmen to cartoonists, animators to fine artists can get something out of this board. It definitely isn’t the lightest board you can get(it weighs 8.2 lbs). However it’s also not heavy either, and the adjustable features plus the craftsmanship more than make up for the weight. The cheapest board that’ll offer the most bang for your buck is the Alvin masonite board set. 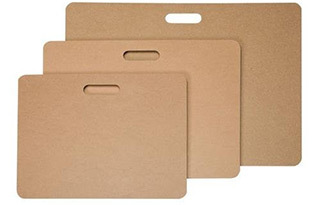 All of these masonite boards come with the small loop at the top for easy carry. But they’re also light enough that you can drag them around anywhere. None of these boards come with clips, although you can easily add your own chip clip attached to the top. I’m thrilled with the quality/price ratio for these boards which is why they really offer the most for your money. If you’re looking for a lightweight board to draw more at home then the masonite boards will do the trick. And of course you don’t have to go with Alvin. But they offer the most consistency with a wide array of sizes to pick from. 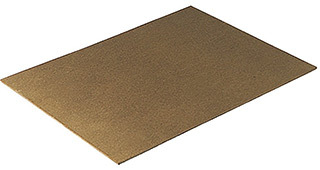 Do a quick search for masonite boards to see all the different sizes you can try. The largest option currently is a 24″ x 36″ board which would certainly cover any size paper for any drawing exercise. Thankfully drawing boards are generally cheap so you’re not risking much by just grabbing one. You shouldn’t have any trouble with any of these so long as you know what you’re looking for and why you’re getting a board. At first this process can feel awkward and clunky, especially if you’re a novice artist just starting out. But the more you practice drawing the more comfortable your board will feel. So as a wise teacher once said: take chances, make mistakes, and get messy!